y = pskmod(x,M) modulates the input signal, x, using phase shift keying (PSK) with modulation order M.
y = pskmod(x,M,ini_phase) specifies the initial phase of the PSK-modulated signal. y = pskmod(x,M,ini_phase,symorder) specifies the symbol order of the PSK-modulated signal. 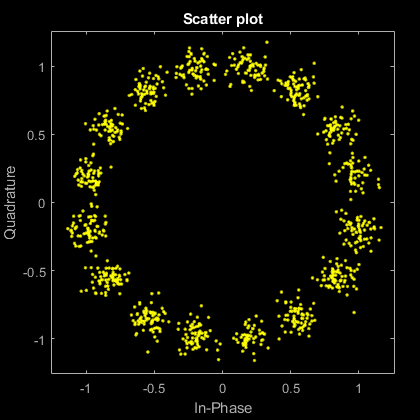 Modulate and plot the constellations of QPSK and 16-PSK signals. 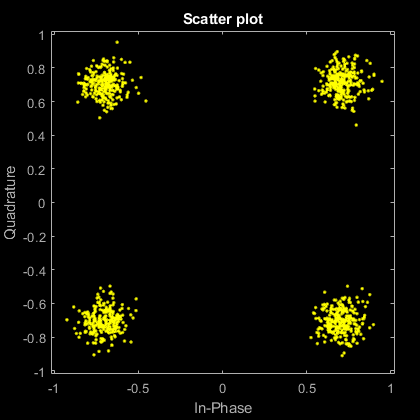 Set the modulation order to 4. Pass the signal through white noise and plot its constellation. Change the modulation order from 4 to 16. Pass the signal through an AWGN channel. Demodulate the received signal and compute the number of symbol errors. Initial phase of the PSK modulation, specified in radians as a real scalar. If you specify ini_phase as empty, then pskmod uses an initial phase of 0. Complex baseband representation of a PSK-modulated signal, returned as vector or matrix. The columns of y represent independent channels.